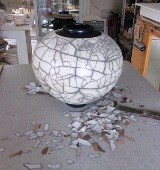 Using horsehair and feathers in raku firing yields incredible marks that can’t be created in any other type of firing. 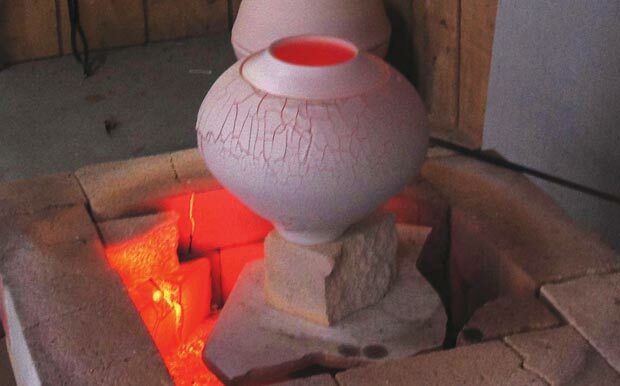 But for optimal results in horsehair and feather raku, you should have a smooth surface. Marcia Selsor creates this ideal surface with terra sigillata and I loved her no-muss-no-fuss method for mixing sig. In this video, Marcia demonstrates this technique and a horsehair/feather firing.- Jennifer Poellot Harnetty, editor. This clip was excerpted from Raku Firing with Marcia Selsor, which is available in the Ceramic Arts Shop. Horsehair and feather raku pot by Marcia Selsor. To learn more about Marcia Selsor or to see more images of her work, please visit www.marciaselsorstudio.com. Nice video. I noticed the feathers you used are more like down feathers. Any luck trying with wing feathers? Should they be applied at a different temperature? thank you for the incredibly easy Terra Sig mix and rake firing!!! You make it look effortless. Jan- The pots for horse hair were taken to 1150-1200 then removed and rolled onto feathers or horsehair. Mary- Thanks for the compliment. There were so many people at Finch’e it is hard to remember everyone. 150 I think. What a great venue. Glad to hear you are still raku firing! Thanks Marcia. I love Raku and I have always been a big fan of yours. Thanks for sharing. Yes, Darvan is called Displex in Australia. Great info! FYI – Marcia Selsor’s website is misprinted above. It is http://www.marciaselsorstudio.com. Must say, your terra sig process is absolutely brilliant! No more siphon and “slurp” the sig. 🙂 I’ve attended a workshop with you at Finch’s and appreciated your talent and generosity. Now…I love your innovativeness. Looking forward to the rest of your DVD. All the best! Enjoyed the video and how concise and orderly you made the process. Did you fire to 1200 before applying the horsehair and feathers? It has inspired me. Sand is the material on the top of a large bucket. It won’t burn and can hold the hair and feathers in a slight breeze. What is the surface you put the feathers and the hair on? Sand or? It does not seem to stick to the pots. Denise, I think it is called Dispex here in Oz. As Fielding said, the darvon is a dispersal . It helps the solids to disperse into the water and stay afloat rather than settle. just a few drops needed. Ask your supplier about dispersals. Sodium Silicate is another. Darvan is a dispersing agent or defloculant used, among other things, to require less water in clay for slip casting. Because it allows the clay to have less viscousity with less water, there is less shrinkage than with the same amount of water to make the slip pourable. A neat video….I like the quick variation for terra sig making, esp. for small amounts! Thank you. Could you tell me what ‘Darvon” is please? I’m in Australia and I don’t think we have anything by that name. Its tricky when people talk in brand names for your international audience. Nice demo Marcia! Was very good to see all parts of the process done so clearly and calmly.